She may have had a queen for a grandmother and a queen for an aunt, but Lady Sarah Armstrong-Jones (daughter of Princess Margaret and Lord Snowdon) wasn’t raised to be a royal – her mother made sure of that. 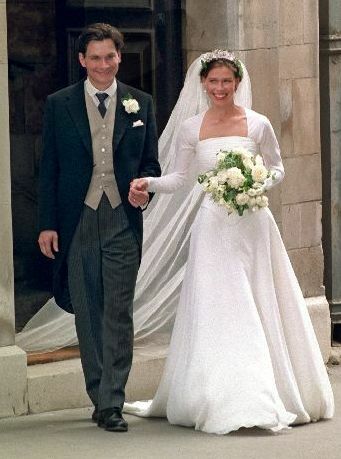 And her wedding, to fellow artist Daniel Chatto on July 14, 1994, wasn’t really a royal affair either: it was held at St. Stephen Walbrook Church in London instead of a large cathedral, in front of 200 guests instead of 2,000. 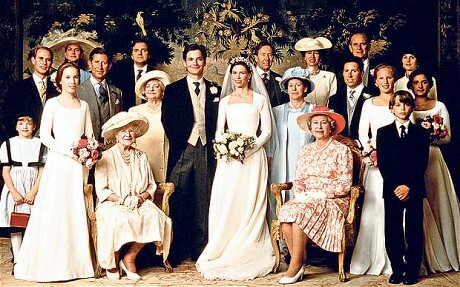 Some of the original reports on this wedding focus on the notable names among those 200 guests (this is 1994, right in the middle of the scandal-filled worst decade of the Queen’s reign), but that’s faded with time and Sarah's wedding gown has remained. She may have been described by People magazine at the time as a "steady, serene sort who has none of her mother's flamboyance", but her wedding gown made its own statement...an understated splash, if such a thing can exist. It was a custom creation from Jasper Conran, with yards of white georgette draped to perfection over the corset bodice and down the skirt and train. It’s a dress that evokes fluid movement even in a still photo. The dress inspiration came from a Holbein portrait – a painter’s inspiration for a painter’s dress – and this is clearly visible in the neckline. 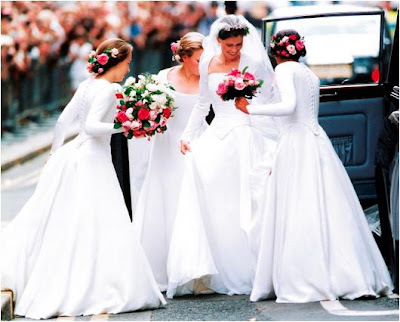 Her bridesmaids were nearly identically dressed, making this one of the only royal weddings for which the attendants’ attire is permanently linked to the bride's in my mind. 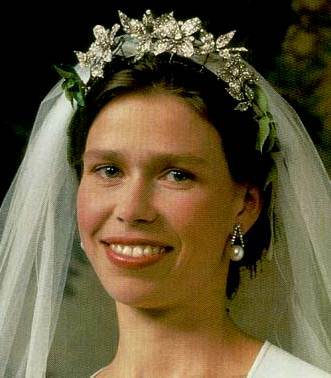 Sarah’s veil was anchored with the Snowdon Floral Tiara, created from brooches given to Princess Margaret by her husband. To enhance the floral effect, some greenery was added amongst the diamond flowers. Sarah’s wedding is the only time we’ve seen it used as a tiara in public. It is in Lady Sarah’s possession now; she has worn pieces of the tiara as brooches. Sarah also still uses her wedding earrings, which feature diamonds and two large pearls. Originality is the buzzword of note for many when it comes to discussing royal wedding dresses, Sarah’s in particular – even though another wedding gown would come along later with similar features. 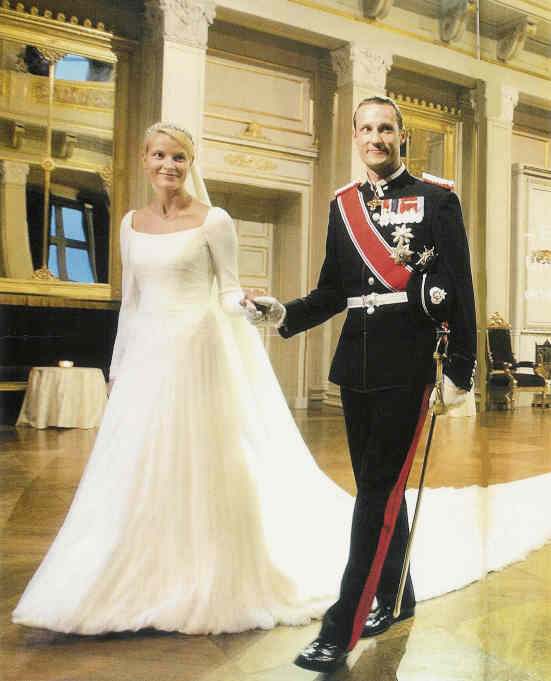 So similar, in fact, that several of you noted in your votes that you forced yourself to choose between Lady Sarah’s gown and Crown Princess Mette-Marit’s. Nevertheless, this dress claimed the #9 spot on your list all on its own. 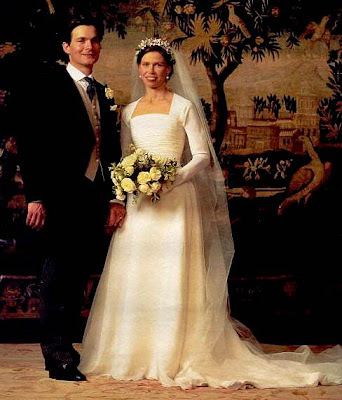 Click here to see my original post on Sarah's gown. The countdown returns on Tuesday!